For an active snail mailer, one of the most important things to keep track of is all incoming and outgoing mail. Keeping track of your mail is the easiest way to make sure you’re replying to letters promptly and not forgetting to do so! If you love making lists, you should definitely be logging your mail. It just takes a few minutes to do! Everyone has their own preferences when it comes to keeping track of their mail. I know a lot of people keep paper logs or journals. I used to do that but I found that I didn’t have a very uniform system and I was often forgetting some information for every entry I made. I quickly switched to logging everything in a spreadsheet. I could have a header of all the information I was looking to log and I wouldn’t be able to forget that information. I created four spreadsheets; two for incoming and two for outgoing. Each set, incoming and outgoing, is separated into domestic and international mail. As I don’t receive a lot of international mail, I add countries to the spreadsheet as I receive them. No way am I going to look up every country in the world and add them to my spreadsheet! Although I don’t receive mail from every state in the US, I do list every state in my domestic spreadsheets. For my logs, I like to track what was sent or received in a letter. This is helpful so I don’t end up sending the same stuff to the same people. I also write a brief description of a postcard’s image. I also love noting how I “met” the snail mailer. It’s nothing crucial but it’s fun to track! One thing I recently started doing is keeping a space where I can put incoming mail during the different stages of receiving it. I have a “To Reply” spot for all letters that I have received and logged but still need to reply to (obviously). Once a letter has been replied to, I place it in the “To Photograph” spot. In addition to logging mail on my spreadsheets, I also photograph all incoming and outgoing mail. It’s a bit excessive but I like doing it! After everything is said and done, the piece of mail goes to the “To File” spot. Right now, filing my mail means putting it in a reusable shopping bag. One day I will have a more official mail storing system! 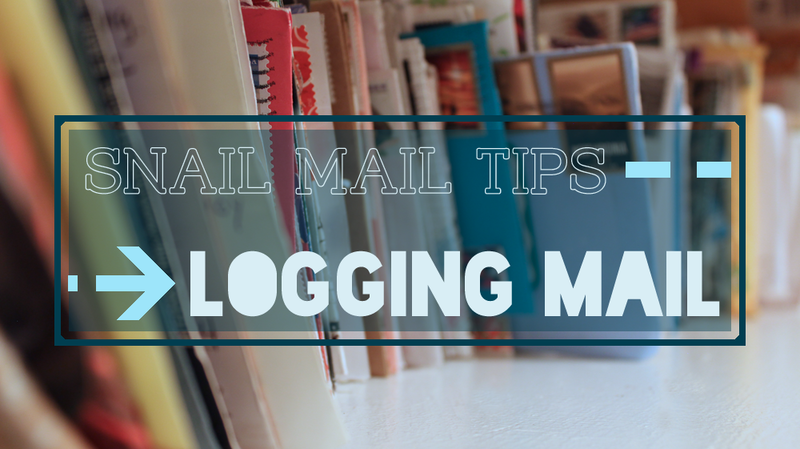 Here are a few tips to get you started logging your mail! If you’re looking for something super simple, I suggest logging a name, date, and what was sent. If you’re looking for something a bit more, log a name, date, what was sent, postmark (incoming), when it was sent (outgoing), when you wrote it (outgoing), when you received it (incoming), when it was written (incoming), and how you know the person. If you know you love writing things down and keeping journals, opt for a paper log. If you’re looking for convenience and something that is easily searchable, create your log on the computer. I should probably take this advice! If you don’t log your mail as soon as you send it, or receive it, it’s likely you’ll forget to do so. Plus, if you log the date of when you send or receive something, you’ll end up forgetting those dates if you don’t log it right away! I love the spots on incoming mail for “written, postmark, and received”! I think it’s cool to see how long it was in the post, etc. Sometimes the postmark is illegible which is one reason I hate the digital postmarks. That is one of the reasons I track those things! I love seeing how long it takes to arrive. I also do it since a lot of people don’t date things >:| It’s my biggest pet peeve when someone doesn’t write the date and I can’t read the postmark. such good timing with this one, tara, i was just thinking about this today and how i really need to revamp my own system! at least i’m keeping a better record on my blog / flickr these days…. this is a great resource! thank you! Hooray! I’m thinking about vamping up my spreadsheets and sharing them as a digital download on the blog. Interested? i totally would be! that sounds awesome! Sweet! I will (hopefully) get it on the blog tomorrow.